But let’s be optimistic about the Pope’s suggestions – after all we have the power of prayer and grace on our side. 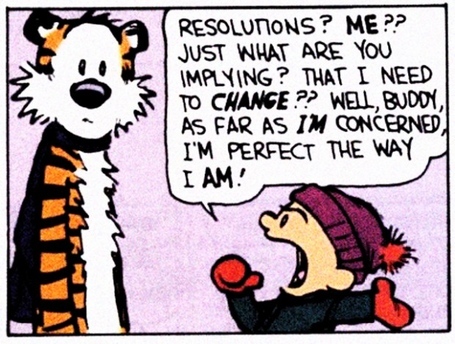 Unless you happen to be like my muse, Calvin, in the comic strip, I suspect you are about to make some New Year’s resolutions. How did you do on last year’s resolutions? About the same as the rest of us? One ad hominem wisdom saying defines “insanity” this way: to keep doing the same thing and expect a different result. Perhaps 2015 is a time to consider changing the way resolutions are considered, made, and hopefully, kept. During the Advent season, many people took the opportunity to celebrate the Sacrament of Reconciliation as a spiritual preparation for Christmas and the New Year. When someone lists out their sins and the areas of their lives that are in need of God’s forgiveness, I often respond with, “If you could only work on one thing from your list, what would be the priority? What would be the one thing you would take into prayer and ask God’s help?” Most people intuitively know their lives and have an answer. I encourage them to do just that: focus on that one thing with God’s help. It is good to know that my intuitive encouragement has some scientific foundation. According to Roy Baumeister and John Tierney in their book “Willpower,” it’s incredibly difficult to make a change in more than one area of your life at a time. Why? Because each of us has only a limited supply of willpower, and we deplete our supply when we try to ward off some temptation or persevere in some new virtue. Did you spend all day resisting the sweets at the office? You will find it incredibly difficult to not have “just a little dessert” after dinner. Choose one habit you want to quit first and conserve your willpower for that priority. Only after the resolution is no longer daunting, should you then move to a new resolution. What if the habit or behavior that you would like to change involves sin? Now temptation, free will, and choice are mixed in the blender of humanity, the siren’s call of “modern” life, and a whole host of other items. I would suggest that Baumeister and Tierney’s advice – focus on one sin/sinful habit – is still good advice. But I would also add that there is another dimension in play. While the Sacrament of Reconciliation offers God’s forgiveness, it also provides grace to seek God’s wisdom in addressing the underlying element of one’s life that needs healing. Is human willpower involved? Absolutely, but it is fortified by God’s grace, the Holy Spirit, and the Wisdom of God in discovering what requires healing in one’s life. And there is more. The Letter of James 5:16 has a verse many folks are not familiar with: “Confess your sins to one another and pray for one another, that you may be healed. The fervent prayer of a righteous person is very powerful.” But I would add, be careful whom you tell. As Derek Sivers shares in his succinct TED Talk (http://bit.ly/18AIS99), it’s often better to keep your goals to yourself. Counter to our intuition, sharing our aspirations with others doesn’t encourage us to persevere or keep us accountable. Sivers goes on to explain that if you really need to tell someone, enlist that person to help keep you accountable by, for instance, checking in weekly on how you’re doing. And in the context of our faith, that means share your success, your failures, and prayer with your fellow Christian. It is in the power of prayer that the grace of God fortifies free will, resolution, and commitment. It is in the power of your prayer/accountability partner that perseverance is reinforced. It is insanity to keep doing the same thing and expecting a different result. Maybe this year try something new regarding your resolutions for a better, more holy life: include prayer, partnership, and the power of God when choosing the one thing. 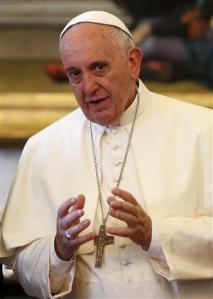 This entry was posted in Musings and tagged FiveThirtyEight, new year's resolution, Pope Francis by Friar Musings. Bookmark the permalink.